A rewritten Part I that includes several new chapters incorporating the latest developments in applicable policy research design, implementation, and products to provide a framework for conducting policy research. A matrix at the start of Part II to easily identify how each of the fifteen case-study chapters correspond with concepts and topics presented in Part I, showing the reader where to look for a specific real-life example of a given topic or concept. Each case is drawn from real instances of policy research to provide students with an opportunity to consider and learn how to grapple with the challenges posed by the needs of public programs and agencies. Cases include local, state, and nonprofit agencies as well as federal-state-local intergovernmental "hybrids." 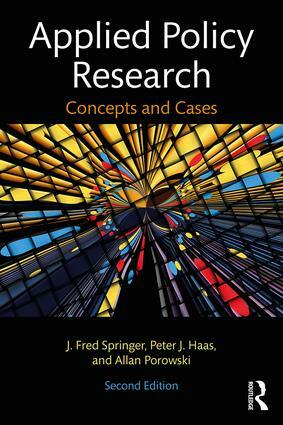 Each chapter is presented in a uniform format: (1) a detailed description of a policy research problem; (2) a discussion of the unique challenges posed by the problem; (3) a description of the policy research techniques used; (4) a summary of the outcomes or conclusions associated with the research as it was conducted; and (5) conclusions about the implications or lessons for policy research. Illustrative figures help students understand the stages of policy research, and end-of-chapter tools such as discussion questions, assignments and activities, and case studies "at a glance" help students master not only the particulars of each case but the broader skills needed in future research. Applied Policy Research, Second Edition will be essential reading in all policy research courses with a focus on practical outcomes and student preparation for public service.